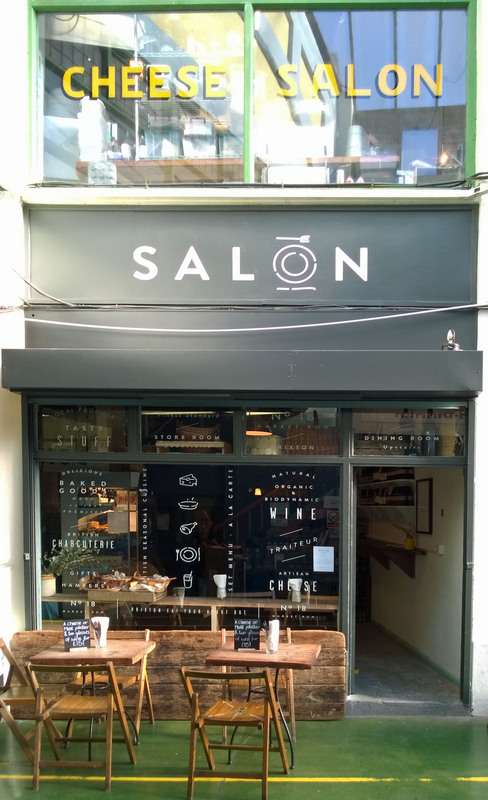 We reviewed Salon at Cannon and Cannon last year and decided it was time to give it another go when our original restaurant choice turned out to have no food on a Friday night. We were not that hungry and only wanted a snack, so we chose Salon given its reputation for small interesting dishes. The décor hasn’t changed since our last visit, although the tables were arranged slightly differently. This was a distinct improvement as we remember our anxiety about having our chairs brushed by waiters balancing full plates. However, it is still a bit disconcerting to realise that you have just pressed down the treadle for a sewing machine on some of the smaller tables. You can now see into the kitchen from some of the tables and it is larger and much improved. The menu offers a few appetisers or the full fixed menu of 3 or 4 courses with accompanying wines. We were interested to see that the price has not changed much from a year ago. We chose the appetisers – a short list, so this is a brief blog and our readers should look at last year’s entry to see a review of the full menu. Again the food starts with a slab of locally sourced sourdough bread with an equally generous portion of butter scattered with salt. This keeps you going while the kitchen prepares each course. We chose the croquettes and the tempura samphire accompanied by a glass of Dao wine and a Negroni. 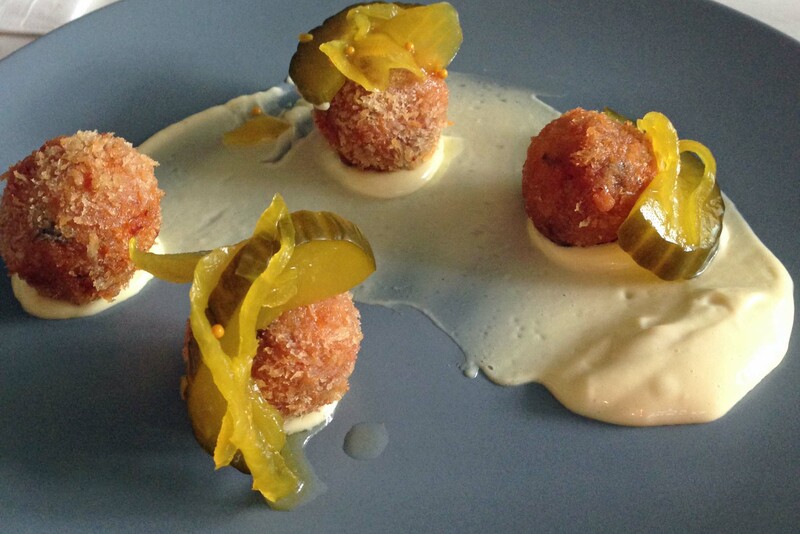 The croquettes came first and they were accompanied by a mild mayonnaise. They were very hot and very wonderful – a crispy ball filled with rich pork. Salon is renowned for its meat and they even have special Sunday lunches to celebrate the meat club with a butchery demonstration to start. It is now on our list to sample, if we can organise ourselves to book. The second appetisers was a bit of a disappointment. 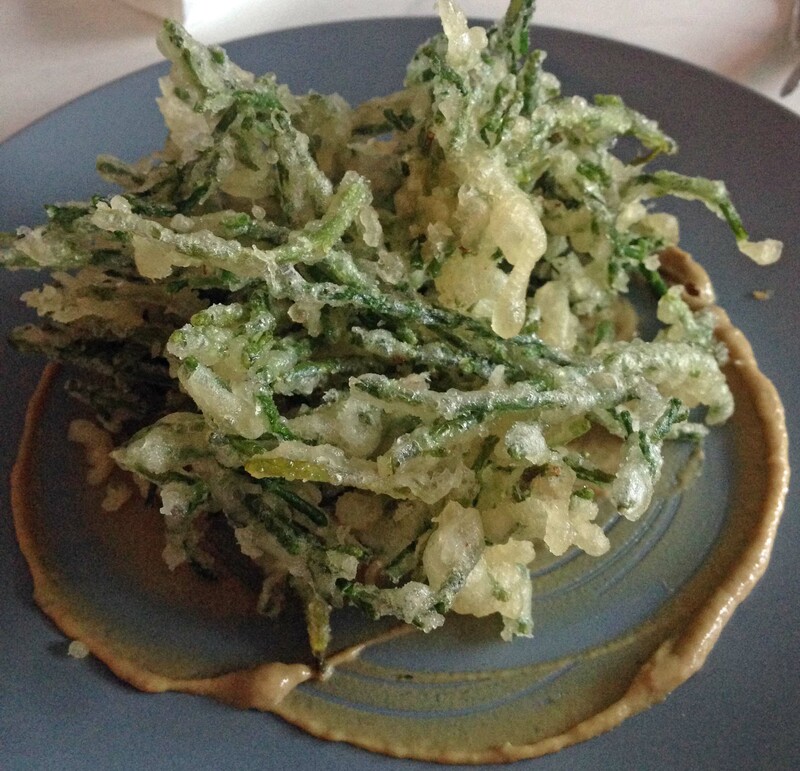 Tempura samphire is an inspired idea and it looked incredibly appealing on the plate. But the dish relies on a couple of things to make it perfect. The delicate flavour is overwhelmed if the oil it is fried in is too strongly flavoured or not hot enough. This dish unfortunately suffered from both mistakes. The slightly cooler temperature of the oil meant it was cooked for too long making it too greasy. We also suspected the oil may have been used for the croquettes and several other things that week and this produced a slightly rancid flavour to the final dish. It was accompanied by an anchovy mayonnaise, which again was inspired, and would have given a rich saltiness but unfortunately it competed with the rancid oil flavour. The samphire also needs to be picked over, as some parts were more like bits of stick. This restaurant is now well run with waiting staff who can explain the dishes and it didn’t take long for us to be served. The room itself is prone to be noisy and is clearly a place for a party. We left before the Friday night birthday revels began but we can see that it would be a great place to celebrate. Two drinks and two appetizers cost £26.95 including a tip – not cheap and we suspect that the set menu is better value.